We are pleased to announce that ‘Pilkington Spacia™’ has been named ‘Product of the Year’ by World Architecture News (WAN), the world’s leading supplier of news to the global architecture community. Brendon Moss, a design and construction associate at Tishman Speyer, who is on the WAN judging panel, considers Spacia™ to be "space – aged technology’’ and that the vacuum glass system it features can be referred to as the ‘holy grail’ of intelligent glazing. 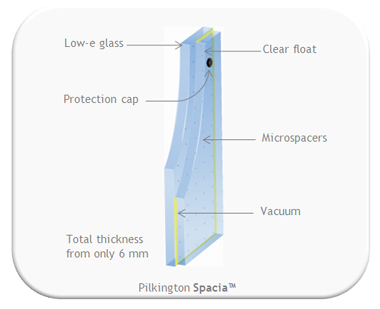 Pilkington Spacia™ provides a number of advantages for architects and home owners with the most notable being its ability to improve the energy efficiency of older, traditional buildings, where original frames have to be retained. The low weight of Pilkington Spacia™ allows for the upgrading of box sash windows, with very little adjustments to the operating mechanism. Where new windows have to be fitted in older traditional buildings or in new build, Pilkington Spacia™can be installed to give the appearance of single glazing, with the performance of double. Specified by United House for a social housing project in the London Borough of Camden, Pilkington Spacia™ has already demonstrated savings of up to £300 a year on residents heating bills. In addition, the old Milton Keynes Central Bus Station has also benefited from a Pilkington Spacia™ make-over without having its modernist appearance altered. For more information and case studies on this award winning product head over to the Pilkington website here.